Roman Week: Doctor Who - Looking Back At THE ROMANS | Warped Factor - Words in the Key of Geek. 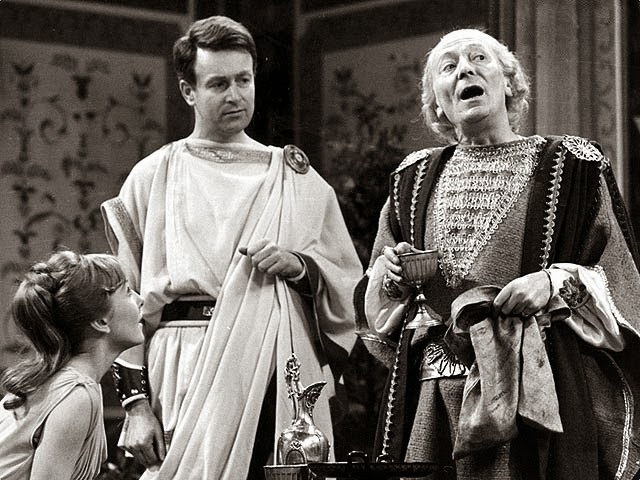 Andrew East looks back at the First Doctor's trip to ancient Rome. The Romans is well known as the first 'comedy' episode of Doctor Who and I love it. It is truly hilarious - the regulars sparkle with a comedy script, especially William Hartnell, and the slapstick/farcical elements play out really well. The story sees the TARDIS crew take a holiday near Rome and then rollick around Nero's court as lyre players, slaves and gladiators. There are slightly darker aspects - mainly Ian's storyline - but they don't seem at odds with everything else that is going on, and the story ends with the beautiful pay off of the Doctor inspiring Nero to burn Rome. Some of the jokes are wonderful: the Chesterfield/Chesterton/Barbara's calling you; the 'she looks after the liars'; and 'close your eyes and Nero will give you a big surprise...Pardon' (Jacqueline Hill's delivery of that single word is hilarious). Although Ian's storyline relies on a number of coincidences everything else is too much fun to care. The concept of the Doctor and Vicki having a parallel storyline to Ian and Barbara, and the two pairs never knowing how their paths have nearly crossed, is original and a lot of fun. Then there's Vicki unwittingly saving Barbara from poisoning and the Doctor constantly foiling Nero's attempts to accost Barbara in Episode 3, both of these storylines work really well. Ancient Rome, and the nearby areas, are well depicted - Nero's palace; a Roman villa; a Roman market; a countryside lane; a Roman galley, beach and cells. The costumes are, probably, accurate and look stunning, particularly the Doctor's and Barbara's. Historically we have, obviously, Nero but also his (something like fourth wife) Poppaea and the official court poisoner, Locusta. The rest of the Romans are, I think, fictitious but it is an interesting touch to have Tavius revealed to be an early Christian. 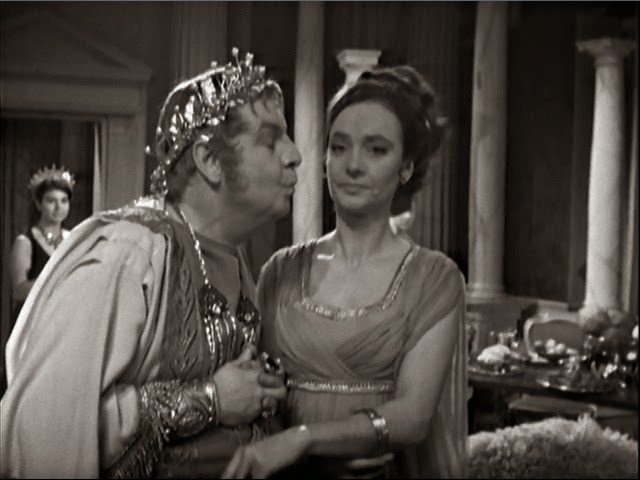 The Doctor lectures Vicki on interfering with history when she nearly poisons Nero (and does, technically cause the death of comedy servant Tigilinus). The entertaining exchange at the close of the story when Vicki accuses him of influencing history by inspiring Nero to burn Rome is an interesting twist on his rather more serious discussions with Barbara in The Aztecs. I rewatched this having just listened to the 6th Doctor lambasting Evelyn back in 100 BC, and it was interesting to see this second comedic take on Rome and the problems of interfering with established events. 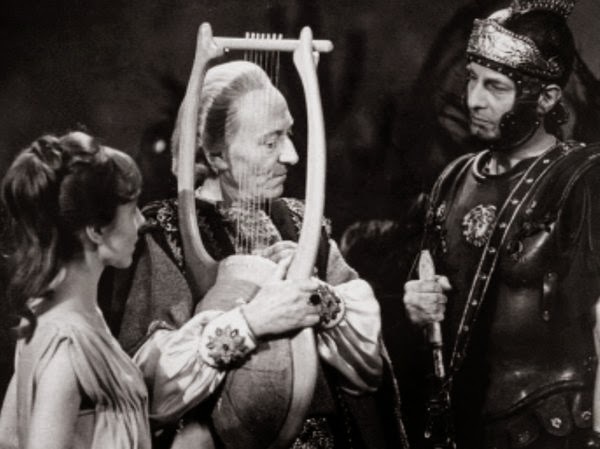 The Romans is a great story and one of the highlights of the Hartnell era - the regulars are all on top form and the guest cast is practically faultless - with special mention for Ian's surrogate companion Delos (played by Peter Diamond) and Locusta. Dennis Spooner's script is brilliant and is proof that Doctor Who, as a series, can do practically any genre when in the right hands.